Every now and again we get a project that we can really get our teeth into. 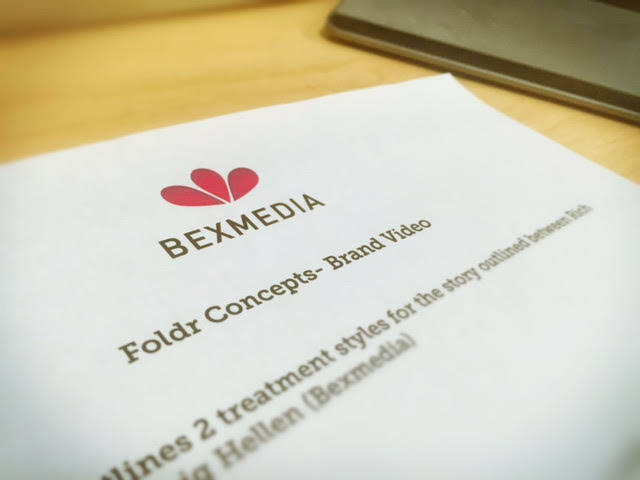 After completing a successful trade-show motion graphic around a 6 months before, the Foldr team came to us with a much bigger challenge, to create their brand video. This video had an aim to set the app in new markets that the Foldr team were looking to explore over the coming months, the video needed to capture this new direction for the brand. Firstly we needed to get the concept and the message. This bit takes time, we already knew the brand after our previous projects with Rich and the team and wanted to come up with a concept that would show how the product fitted into all stages of a persons life. Once we knew this very simple fact, our choice was easy... A storybook, moreover; A pop-up book! We had a whole bunch of great brand assets from our previous project but we needed additional artwork for us to create the truly unique story that, between us, we had constructed. We specified out all the artwork required and their design team got to work, providing us with the materials to create our animation. Now it was time for us to really get on with the meat of the job; the animation. The majority of the content was animated within our standard motion graphics package however there were a few bits where we had to combine this with some 3d modelling to achieve the rich visual environment demanded by the piece. The scenes were put together with a rough voiceover to allow us to gauge the timing of the whole piece and keep our client involved with creative points of decision along the way. Although we always have a great creative vision for a piece, we often construct our workflows to involve our clients eyes to make sure we are on the right track. After auditioning a few different voiceover artists for the piece, we comissioned a “Mid-atlantic” tone of female voiceover with a soft and friendly style, matching the brand graphic and general tone of voice. The team at Foldr appreciated that choosing the correct audio for a piece is incredibly important to ensure we hit the mark, the experimentation with voices and time spent editing the music created the right accompaniment for the animation the team were busy creating. The final result was one both ourselves and our client were very proud of.